What could be better than fresh herbs right at your backdoor? 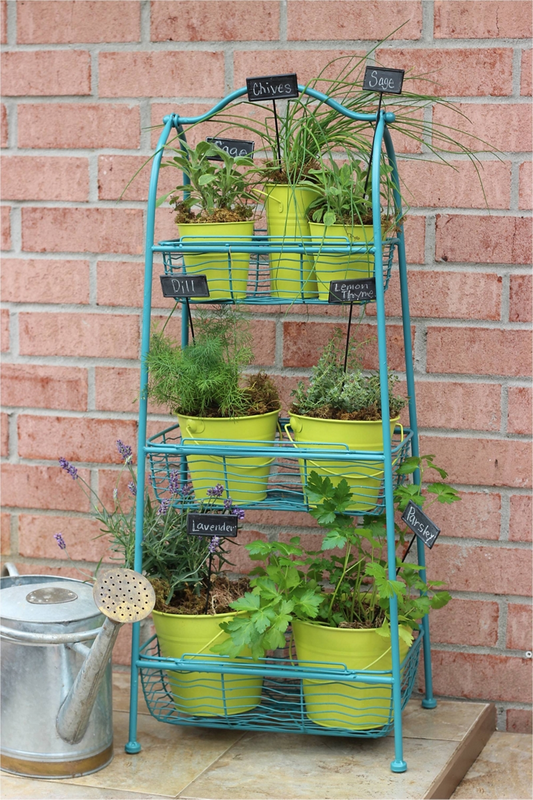 Fresh herbs in this handy, colorful plant stand! Clean plant stand, buckets, and plant labels to prepare for painting. Disassemble plant stand if needed. Paint all areas of plant stand in Krylon® Fusion All-In-One™ Satin Rolling Surf. Repeat coats as needed for complete coverage. Allow to dry. Paint galvanized pails in Krylon® COLORmaxx™ Gloss Citrus Green. Repeat coats as needed for complete coverage. Allow to dry. Paint plant labels stakes in Krylon® Chalkboard. Repeat coats as needed for complete cov-erage. Allow to dry. Transplant herb plants into painted pails, adding potting soil as needed. Place in plant stand. Condition Chalkboard painted label stakes with chalk, as indicated in instructions. Write name of herbs on each stake with a stick of chalk. Place in appropriate pail.